620 kW parking canopy solar system. Legatus6 constructed a 620kw canopy-mounted array for the US Army Corps of Engineers (ACOE) at the Sea Girt National Guard Training Center in New Jersey. Legatus6 was awarded the prime contract for the construction of the array under a design-build contract. Originally, the RFP called for an extension of an existing PV array and the construction of a new array, but through updating the design in the RFP and condensing the project into a single array, Legatus6 was able to increase the system size by almost 120kW and the power output by 20% without an increase in cost to the government. Among the challenges faced by Legatus6 was sandy soil conditions for the deep foundations system and very high water table due to the proximity to oceanfront. This required Legatus6 to install temporary steel casings for the 17 foot-deep foundations and to ‘tremie’ in the concrete, displacing the groundwater as the concrete was placed. Legatus6 executed this construction method flawlessly, and encountered no problems despite the challenging conditions. 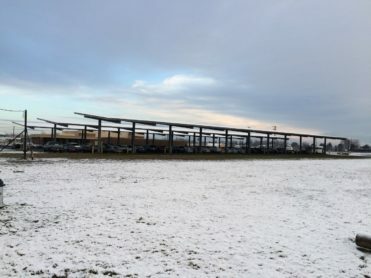 Legatus6 was also responsible for designing and installing a medium-voltage tie-in for the project at 12.5kV using a dedicated step-up transformer for the solar array. The project is currently operational. Food and Drug Administration (FDA) – Laboratory Equipment Maintenance: Legatus6 maintains sophisticated research laboratory equipment at the Food and Drug Administration (FDA) as a partner in the Laboratory Equipment Services joint venture. The laboratories include biosafety level 3 (BSL3) labs that require 24×7 monitoring and one-hour emergency response. We provide full time on-site maintenance staff plus 24×7 emergency services. Our on-site staff provide direct maintenance services, manage our original equipment manufacturer (OEM) subcontractors, and track the preventive maintenance and status of all the equipment. We maintain a Rees Scientific monitoring system with probes in key equipment to continuously monitor their temperature and functionality. Legatus6 is currently constructing a 1.75 MW ground-mounted solar plant at NASA’s Kennedy Space Center (KSC) as the prime contractor. Responsibilities include connection to NASA’s medium voltage network. At the substation that NASA owns and operates, KSC is served by 3 incoming 115 kV lines from the utility, Florida Power and Light. Legatus6 revised and updated the design originally provided by NASA, including a 5-way pad-mounted dielectric-insulated MV switch at 13.2 kV, containing 4 Vacuum Fault Interrupters for the solar array. The transformers have a dedicated circuit in the VFI for independent control. Legatus6 is responsible for designing, procuring and installing relaying equipment from Schweitzer Engineering Laboratories (SEL). The SEL equipment will interface with existing NASA network and provide relaying. Legatus6 provided procurement, warehousing, loading/unloading, and tracking of maintenance materials for NIH through its Subcontract to Nangwik Services. Total Contract Value: $ 2,000,000 (Services only). An additional $5M per year of material was purchased through the contract. Purchasing: Legatus6 had a buyer responsible for researching required material, locating an appropriate supplier, and initiating the purchase. We found replacement parts for a wide variety of specialized systems in NIH’s research laboratories and clinics. Warehouse Operations: Legatus6 staffed the warehouse at NIH’s Bethesda campus. This warehouse provided maintenance material for all 350 medical and research facilities on campus. Our staff members were responsible for customer service, receiving, disbursing, and warehouse stocking. Asset Tracking: Legatus6 tracked the disposition of every item procured, warehoused, and disbursed for NIH. We tracked where each item was installed (i.e. installed at which location, on which piece of equipment, in which building) using WASP inventory and asset tracking software. Information Integration: Legatus6 managed the integration of information from the NIH maintenance management system MS2000, the master supplier MSC Industrial, and the contract’s WASP inventory system. Legatus6 first integrated the data manually and the automated the process through a cXML punch-out integration. Legatus6 had overall responsibility for the integration and coordinated with the NIH IT organization. 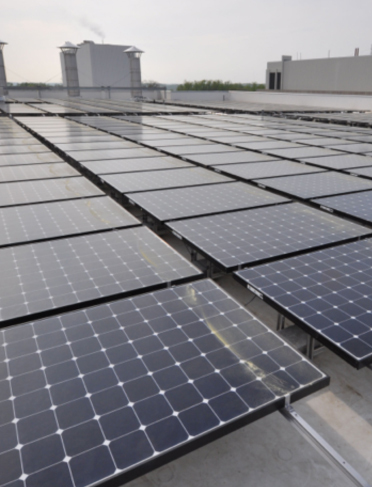 Legatus6 constructed a 300 kW rooftop-mounted solar array at the NIH campus in Bethesda, MD. The array consists of 920 Sunpower E20 modules which are the highest efficiency commercially available module on the market. Though solar was included in the building specifications, Legatus6 was responsible for producing electrical and structural design drawings, which were self-performed. Among the challenges faced were the height of the building (over 110’) and the location of the inverters in the finished building which required special rigging to accommodate. In addition, Legatus6 engineered the inverter data monitoring system to interface with the building data acquisition system so that the PV array can be monitored on the same platform as other building function. Legatus6 provided third-party inspection and quality control of the custodial contractor at the National Institutes of Health (NIH) in Bethesda, MD. This 247 kW ground mount system was built using a fixed-tilt rack structure and concrete foundations. Legatus6 encountered poor soil condition at the required footer depth and employed a testing agency to certify the bearing capacity for each set of foundations to ensure no shifting would occur over time. The Maryland Department of the Environment has very stringent requirements for mitigating storm water run-off. Consequently there was a heavy site component for this portion of the project that required three storm-water bio-retention areas totaling 3400 square feet of surface area and storm-water connections 17 feet below grade. Legatus6 managed these challenges while completing the ground mount system (and the entire project) on schedule.